The Tilt ‘N Plug Jr. model TNP151S is one member of compact interconnect solutions designed for installation into a table in a presentation system. 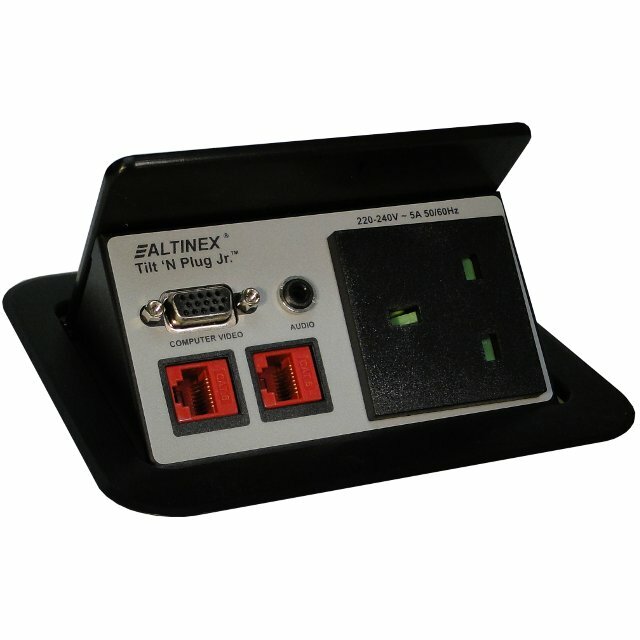 The TNP151S provides access to computer network and AC power connections when needed, and hides them when not. The input plate on the TNP151S is accessed by pushing down on the top panel, which tilts into view with help from a pneumatic spring inside. Once opened, the input plate remains securely in place. The input plate is hidden by pressing down on the top panel, which closes the lid. In its closed position, the top panel lies flush with the table top, held in place by a mechanical latching mechanism. The TNP151S provides a single input plate with 2 Network (RJ-45 F-M) input connections in 6 ft (2m) length and 2 AC Power connection in 9-10 ft (2.7-3.0m) suitable for use throughout the U.S. and Canada. The unit can also be customized with different connections and colors. To do so, click the link shown above. All Tilt ‘N Plug Jr. Signal Management Solutions come with a standard top and bezel offering a high quality clear brushed aluminum finish. Other finishes or special bezel configurations are available upon request. The network signals are passed through the unit with connection to the network system being made under the table. No signal processing or buffering takes place.